There is so much to see around the Mornington Peninsula – pristine beaches, vineyards and wineries, nature parks, markets, and historical landmarks. To truly experience the laidback vibe of the area, you can go walking, sea kayaking, or cycling. There are a number of cycling trails that you can follow to truly explore the beauty of the peninsula. Cycling is a great way to take in the scenery at a slower rate than if you roared past in a car. And if you’re an enthusiastic cyclist – it is an excellent way to check out the Mornington Peninsula. If safety is an issue – there are boardwalks and off-road trails to follow minimising exposure to traffic and congestion. For a quick morning cycling along the coastline, head over to the Frankston Waterfront, pedal along the boardwalk, and soak in the beauty of the 10km beachfront from Wells Street to Olivers Hill. Here you can see the beautiful view of Port Phillip, and if you get need some time out to chill and give your legs a break, park your bike and sit, relax and breath in deliciously fresh sea air. Be sure to make your way to the 220m long Frankston Pier and discover the 22 letter “secret message” on the pier flag. Shhhhh… we’re not giving away any spoilers! If you want to get a feel of the countryside, then this trail is for you. The track begins at the Red Hill Centrepoint, an inland village that functions as the rural service centre for the Red Hill District. It follows the old railway line, passing through vineyards, and grazing properties overlooking the Western Port. It ends in the Merricks Station Ground, which is a small township consisting of a few houses and wineries. Why not visit one of the wineries while you’re there and have a bite to eat along the way. The Melbourne road trail is another good option for countryside cycling. It is an inland trail that begins in Rye to Sorrento and ends in Portsea. You’ll pass by Sorrento Pier, Sorrento Park, Portsea Foreshore, and the Mornington Peninsula National Park. This cycle route encompasses some of the most ‘touristy’ sites of the region. You’ll find the ruins of old concrete bunkers, and the Old Quarantine Station. Some parts of the trail are a bit hilly, but if you tackle the ride at an easy pace it is still suitable for beginners. If you are up for a little adventure, take on the challenge of tackling the 26 km Two Bays Trail starting from Dromana through to Cape Schanck. The trail begins from the Arthur’s Seat Lookout Tower and we highly recommend that you take the time to visit the tower as the views are Amazing (and once you’ve seen them you’ll understand why we used a capital ‘A’ on the word amazing!). The trail heads on to the Long Point Circuit, all the way to Cape Schank Lighthouse. The lighthouse is iconic to the Mornington Peninsula, and again we recommend that you schedule some time to check it out while you are there. 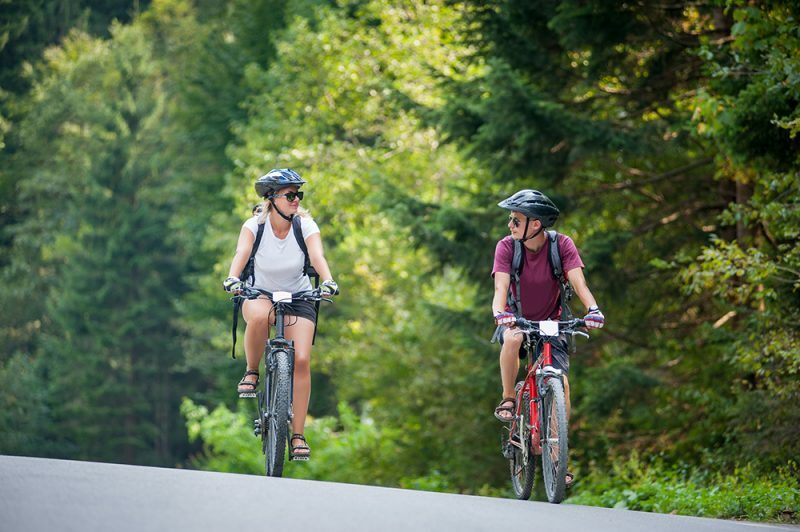 Please note, there are a few steep areas and challenging sections along the way of the route, so be sure to take care, rest when you need to, use a bike that fits you and (as legislation rules) wear your helmet whenever on your bike.